At Bright Brewery we love finishing a thrilling day of riding by sharing a great beer with friends. Combine that with the opportunity to raise vital funds for life saving equipment and we think you have an ideal way to spend any Saturday! Bright Brewery is excited to join the Alfred 6 Hour as naming rights sponsor to help provide a fun day of mountain bike action that will contribute valuable support for Emergency and Trauma care at the Alfred Hospital. The Alfred 6 Hour is a charity mountain bike race raising funds in support of Emergency and Trauma care at the Alfred Hospital. Join us in beautiful Bright for a fun Saturday of MTB action around Mystic MTB Park, followed by presentations at Bright Brewery. The target for this year’s Alfred 6 Hour race is to raise $15600, which will assist with the purchase of a high resolution x-ray monitor for emergency and trauma patients. We hope everyone who enjoys mountain bike riding can join us for the Alfred 6 Hour on Saturday 17th September to ride for glory, earn your beer and make a great contribution to the important work of The Alfred Hospital. The 6 hr riders sprint off! June 2016 marks the 10 year anniversary of Bright Brewery opening our doors at 121 Great Alpine Road, in the heart of beautiful Bright. The anniversary marks a new era for Bright Brewery, with the purchase of a second site in Bright to build a production facility, as well as welcoming 2 new brewers. Bright Brewery owner and founder, Scott Brandon, said that there has been plenty of challenges and changes since opening for the Queen’s Birthday Long Weekend in 2006, but overall the business has exceeded expectations. “Probably the first five years were the most challenging, when we were trying to do everything on a shoestring,” Mr Brandon said. “Before the new building it was an outdoor venue so we were limited in what we could do, so to have a warm and cosy environment regardless of the weather, has made a massive difference to the business and now we are able to build on that,” he said. Bright Brewery’s story began as far back as 2003, when the land was first purchased for the location of the brewery. The first beers were brewed at Jamieson Brewery near Mansfield from late 2004 and served at a temporary bar in Wills Street, Bright, until the building construction and brewery commissioning was completed at the current Great Alpine Road site in mid 2006. The initial desire of Scott and his late wife Fiona Reddaway was to create a cellar door experience that provided great beer and celebrated the outdoor lifestyle of the surrounding high country region. This “brew-pub” model has provided Bright Brewery with healthy business that has a reputation as one of the region’s best destinations, highlighted last year by winning Silver at the Victorian Tourism Awards and being named Business of the Year at the Alpine Shire Awards. With the focus on providing an excellent hospitality and tourism experience, the vast majority of Bright Brewery’s beer production is sold through our own bar – limiting the amount of beer that’s been sent out to the wider market. Now the business is in a positive position to focus on its wholesale operations to further secure its future. The development of a second brewery, also in Bright, will allow for a significant increase in production levels so that Bright Brewery can make its mark on the national retail market, as well as creating new jobs for Bright. “The new facility also provides us with the perfect opportunity to achieve more of our sustainability goals, to make our beer as carbon neutral and sustainable as possible,” noted Mr Brandon. 10 years on, Bright Brewery remains a 100% independent family owned business. 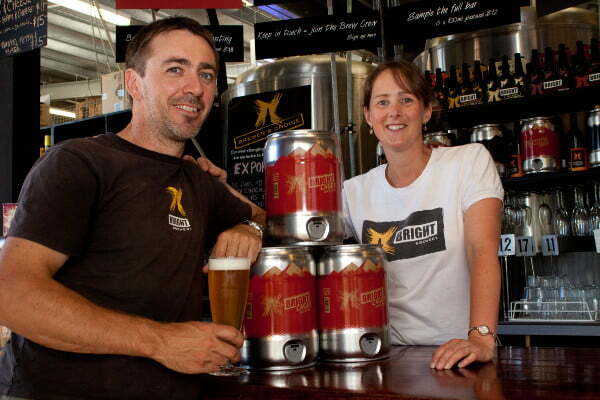 Read more about Bright Brewery’s 10 year journey via articles on The Crafty Pint and Australian Brews News.